Virtual Reality is a really neat idea but it's also problematic. The Oculus Rift, HTC Vive and Samsung Galaxy Gear VR all let us see new, virtual worlds but none of them let us touch it. How do you physically feel what's not really there? Maybe with one of these batshit crazy controllers. There are dozens of them in a dark corner of the Game Developer Conference exposition floor, an area reserved for start ups with oddball innovations and big dreams. Here you'll find a ton of haptic feedback gadgets—controllers that take commands from your touch but also sorta touch you back. If someone can get it right, this could be the key to making virtual reality more real. None of the stuff I saw nailed it, but we're on the right, weird track. Force. Pressure. Tactile feeling. That is what the Miraisens 4D Space navigator promises, and then mostly fails to deliver on. The Navigator is an odd shaped, wired nub that's designed to be held in an uncomfortable three-finger grip. It vibrates as you move it around in a virtual space, ideally sort of like if you were rubbing something over a rough surface. But mostly it just feels like it's vibrating a lot. To its credit, it's not just an isolated motor. Somehow, the Navigator's vibration features is capable of vibrating in a specific direction. One of the company's demos asked me to lift rocks or resist the gravitational forces of a black hole, and the little triangle definitely felt heavier for a moment thanks to its buzzing. I'm not sure what use that is, but it totally worked a little. This one looks more like a piece of exercise equipment than a game controller, but it's actually kind of clever. In the Realm System, you secure a fitness belt around the your waist and then tether's your arms to your body with two short, stretchable cables that limit your movement. You can still extend your arms out all the way, but it takes extra effort—and the resistance can give you the illusion that the actions you're performing in game are a little more real. Motion capture cameras and accelerometers in the grips at the end of the tether measure how much effort it takes to perform a particular action, translating that to simulated force in virtual reality. It's a good idea—and certainly good work in some games—but wearing the contraption does seem like a little bit of a hassle. Here's the perfect example of what not to do: Stick a bunch of large, ugly force-feedback motors on a gardening glove. CyberTouch's harsh, out of place vibrations definitely let me know when I was supposed to be "touching" something, but to be honest, it felt more awkward than having no tactile feedback at all. Powerglove 2. Gloves, vibrating triangles and resistance-based fitness belts may all be a wash, but the Tactical Haptics Reactive Grip almost feels real. Sometimes. The Grip is sort of like a wireless, motion-tracking joystick with a moving grip. Pick up something heavy in game? The controller's handle will gently pull down on the inside of your palm to emulate the friction of weight. It actually works, but only if you hold the controller just right. If you hold it too tight, it kind of hurts. Too loose? Then it's just a jiggling, awkward mess. A neat idea though for sure. 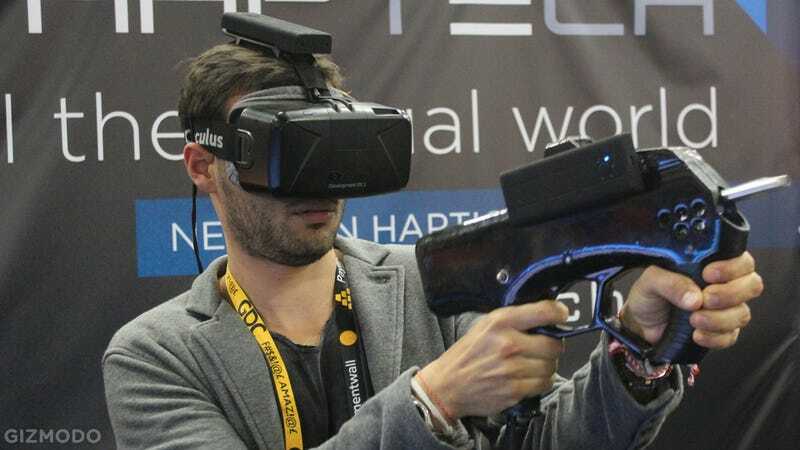 No, that VR doesn't stand for virtual reality, it stands for virtual recoil. Striker VR is a purpose-built force feedback system, design specifically to allow first-person virtual reality shooters to kick back with the appropriate amount of gun recoil. It works by using a special "linear engine" to throw the weight of a metal rod around the interior of the gun, creating backwards or forward momentum as necessary. This itself is a neat idea—if a bit limited to just one genre—but the company's GDC staff was more interested in the bigger picture. Sure, they want people to look to their technology to create better FPS experiences, but they also want to work with companies like Tactical Feedback to create even more immersive VR gaming accessories. It's the right attitude: no single haptic feedback technology is going to be enough to make virtual reality feel real. Even if that means this whole controller thing could get out of hand fast. Who wants a closet full of 980213812098312 unique controllers, right? Okay, okay—technically Valve's funky gamepad wasn't lurking in GDC's start-up alley, but it does use haptic feedback of a sort. See those big, round touchpads? They purr with a light, tactile hum whenever your roll your fingers over them, and it's the only thing that makes them feel okay to use. The physical reaction gives the touchpads weight—and if we've learned anything from the demise of Microsoft's Kinect, it's that we have to feel like we're touching our virtual worlds for them to feel authentic… even if it's just a light touch.